As promised in my post about my plans for planting corn and corn nutrition, here is my simple cornbread recipe. This homemade cornbread recipe produces a real cornBREAD, not crumbly stuff only suited for crumbling into a bowl of pinto beans. This stuff holds together well enough to make sandwiches, though admittedly long, skinny ones. This is also a real CORNbread, not your typical wheat bread flavored with some cornmeal. Thus it's gluten-free. Finally, this CORNBREAD is not an abomination with sugar that tastes more like cake than cornbread. And while I think this is a relatively healthy cornbread, it is the yummiest freaking cornbread I ever tasted. My recipe is based on using a flint corn for the flour. Nevertheless, I am recommending their Jonnycake cornmeal highly. This stuff made the most scrumptious cornbread I ever tasted. 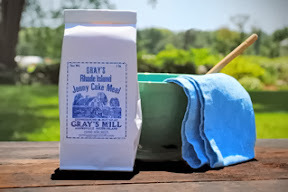 And there's two different traditional johnnycake recipes on the label, both of which were pretty darned yummy too. At $6/lb, you can't go wrong. My recipe is adapted from Carol Deppe's Universal Skilletbread Recipe in The Resilient Gardener: Food Production and Self-Reliance in Uncertain Times. Her recipe is universal because it includes adaptions for flour and dent corns, but mine is based on using a flint cornmeal. I do make a few cents if you buy her book from my link. Go me! If you have any interest at all in gardening, homesteading or self-sufficiency, this has more practical information than you can shake a hoe at. I've been gardening for a couple decades and have read scores of books and was amazed what I learned from her. And if your primary interest in food lies more along the lines of preparing and eating it, you will find much practical information about the best varieties of corn, beans, potatoes and squash for many different dishes, scores of easy recipes and details about how to cook duck eggs. Place 1 1/2 cups cornmeal in medium bowl, whisk to break up lumps. Place another 1 1/2 cups cornmeal and the baking powder in smaller bowl, whisk to mix. (Use a different sized bowl mostly to track which has the baking powder). Place water, butter and salt in medium saucepan. Crack 4 eggs in a small bowl or Pyrex cup and scramble with fork. 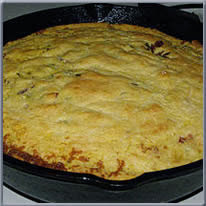 Place bacon grease in a cast-iron skillet and put in oven; preheat to 450. Bring contents of saucepan to boil, then add plain cornmeal from medium bowl, 1/2 cup at a time, whisking after each addition. After water returns to boil, reduce heat to medium-low and simmer for 7 minutes with constant stirring. Remove saucepan from heat and whisk in eggs to form pre-batter. Stir cornmeal/baking powder mixture into pre-batter very rapidly, then immediately pour into skillet and place in oven. Bake for 30-35 minutes, until browned on top and pulled away from sides of skillet. Turn loaf out on to cooling rack and let cool for a half hour. If desired to make it more square for storage, cut the end off of two sides of the loaf (cook gets to eat these!). Then slice and place in covered Pyrex or plastic container. Store at room temperature for 3-4 days or refrigerate for up to two weeks.